Editor’s Note: The Kentucky Fatality Assessment and Control Evaluation (FACE) program is a NIOSH-funded program that studies work-related fatal injuries and exposures and produces investigative reports containing safety recommendations for workplace injury prevention. The content of this report has been edited for space requirements. In October, 2016, a 42-year old male tow truck driver (the victim) had loaded a disabled pickup truck onto his rollback tow truck on the southbound shoulder of a four-lane, undivided highway. As the victim was entering the tow truck cab on the traffic-facing side of the truck, an oncoming van swerved into the emergency lane and struck him, causing fatal injuries. The tow truck driver was pronounced dead at the scene. The victim was a 42-year-old male, married father of three and a volunteer coach for the Special Olympics. While he had worked for his current employer [a towing and auto repair center with eight employees] for two years and two months, his family stated that he had been a tow truck driver for several years. His employer stated that he was a dependable employee who was known to perform his job duties in a safety-conscious manner, kept his truck clean and professional and generally possessed excellent work habits. The owner reported that toolbox talks [informal safety meetings] were given at the beginning of each work shift. No other formal training was provided. Training for the victim was not considered by the employer due to his level of prior experience. On a late fall evening, the victim received a phone call from a stranded driver requesting vehicle towing assistance on the shoulder of a four-lane undivided highway. Arriving at approximately 10:05 p.m., the tow truck driver parked his rollback on the shoulder in front of the disabled vehicle, exited his cab, spoke with the customer and began loading the vehicle. It was dark and there were no light poles to illuminate the work area. Although it is not required, it is notable that no law enforcement officer was present upon arrival of the tow truck driver and none was contacted to assist with traffic control. While the light bars on top of the rollback wrecker were engaged, no emergency cones, triangles or other warning devices were set up to alert approaching motorists. The tow truck driver was wearing an ANSI Class 2 reflective shirt and Class 3 orange reflective vest — a combination that was compliant at the time with the Manual on Uniform Traffic Control Devices (MUTCD) nighttime visibility standards. After securing the disabled vehicle to the bed of the tow truck, the victim, walking on the traffic-facing side of the tow truck, approached the driver-side door and began to enter the cab. Meanwhile, a van, which had been observed weaving across lanes, approached the victim’s location. As the driver climbed into the cab, the van drifted across the shoulder edge line and struck both the tow truck driver and the tow truck. The victim came to rest in front of the tow truck on the edge of the shoulder’s pavement and the van came to rest in the ditch next to the shoulder. The driver of the van stated that he was confused as to where he was and what had occurred. He was cited with not being under proper control of the vehicle. The driver was given a portable breath alcohol test (PBT) and submitted to a blood test for drugs. His PBT result was .000. Upon the completion of this report, toxicology results were not consented to obtain. Recommendation No. 1: Tow truck drivers should limit the amount of time spent on the traffic-facing side of the truck. The victim in this case was fatally struck while entering the cab of his tow truck on the traffic-facing side; his back was turned to the road during impact. To reduce the risk of being directly struck by passing vehicles, tow truck drivers should limit their time spent on the traffic-facing side of the truck. There was sufficient room to enter the cab on the non-traffic-facing side of the truck. 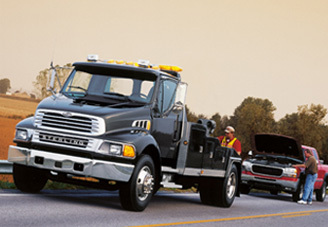 To further prevent injury, tow truck operators should use winch controls on the non-traffic-facing side when the tow truck is equipped with dual winch controls. When tow truck drivers must be on the traffic-facing side, they should keep an eye on the adjacent lane and any approaching traffic as often as possible. Recommendation No. 2: Law enforcement should be present to aid in traffic control when vehicles are to be towed at roadside. upon arrival of the tow truck operator, law enforcement should be contacted and the presence of an officer should be requested. To enhance awareness of the law, officials should consider increasing the number of signs along Kentucky roadways and public service announcements which promote the law. devices such as bi-directional reflective triangles. Despite taking more time, tow truck drivers should employ the use of warning devices so motorists may take more prompt actions to slow down or move over to the adjacent lane. When setting the devices, tow truck operators should carry the devices in front of them to increase visibility to passing drivers. The tow truck operator should never turn his/her back to approaching traffic during the warning device placement process. Recommendation No. 5: Tow truck operators and owners should consider National Traffic Incident Management Responder Training, regardless of company size.